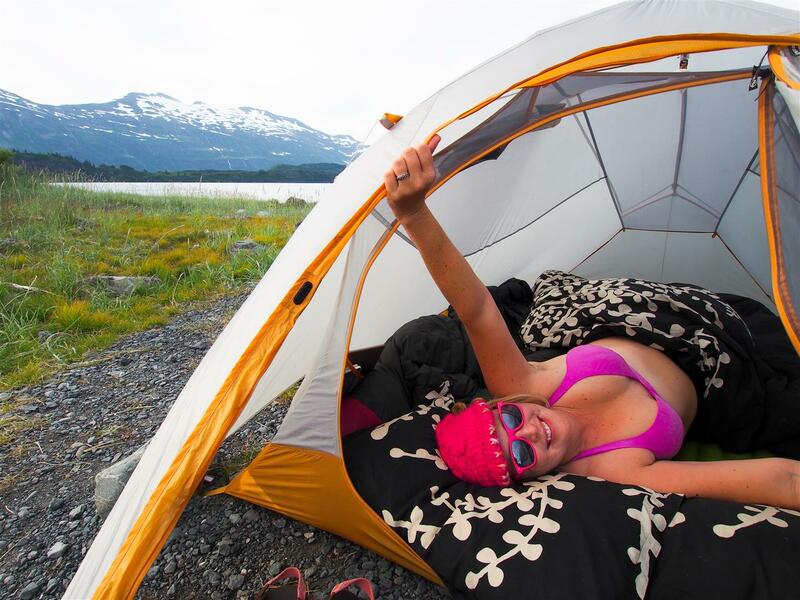 There we were, camped in front of a giant glacier, next to the ocean, in a place of indescribable beauty. I looked around and started counting waterfalls. 36. I could see 36 waterfalls from where I stood. We were in Blackstone Bay, a small arm of Prince William Sound in Alaska. We had just been dropped off by a water taxi for four days of frolicking in the wilderness. We weren’t exactly roughing it. We had three sleeping bags, a down comforter and two pillows, as well as two sea kayaks and all of our mountaineering gear. We planned to explore the bay by kayak and do some mountaineering or glacier trekking. We were loaded with both adventure AND comfort gear. We were most definitely glampin’! 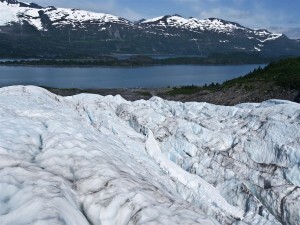 Lawrence Glacier loomed behind us, a steep, bright white hunk of ice. We took a glacier travel and crevasse rescue course a week before this trip, and it gave us the confidence to walk around on dry glaciers, that is, glaciers without snow. We were ready to try our new skills. Lawrence Glacier had plenty of delicious icy curves for us to explore. This was going to be good. First we explored the bay by kayak. 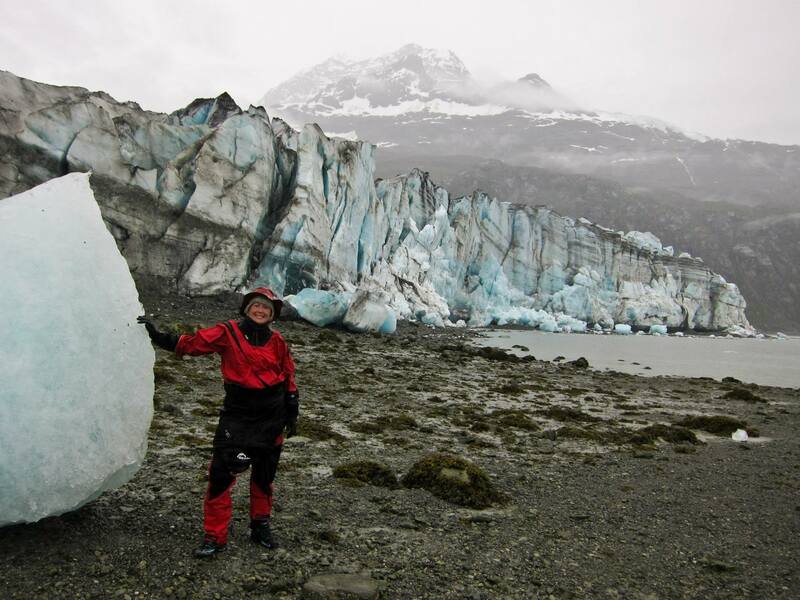 Two tidewater glaciers tumbled all the way down to the sea. 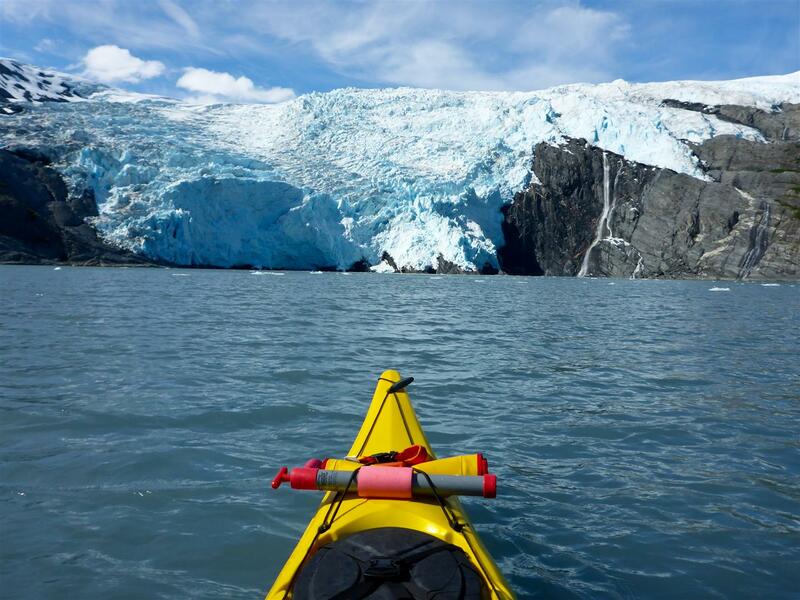 We enjoyed the gentle sounds of our paddles plying the icy water, punctuated by a loud boom every now and then when the falling ice from a glacier crashed into the sea. Thankfully we were never too close to one of the glaciers when a large chunk of ice came off, which can create a dangerous wave! One snow white glacier was perched atop a cliff, slightly overhung, with a waterfall flowing from its base. It was breathtaking. Holy. This place was holy. We paddled over to see the waterfall and a small group of Kittiwakes (birds) flew by, loudly protesting our presence. Nearby we also found a large colony of Kittiwakes, chattering among themselves. We returned to camp, blissed out by the wonderful paddling. We took a short nap, picked some berries and then decided to scout Lawrence glacier. We walked around, waded an icy stream, and eventually found a good way to reach the side of the glacier. It was a reasonable hike with no unstable ice or exposed climbing. 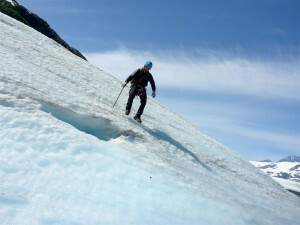 When we reached the glacier I felt hesitant, so Brian climbed on it first and started walking around. After awhile I decided to join him and we enjoyed a little bit of the glacier together. When we reached the first steep section we decided to call it a day and return tomorrow with more time and energy. We were both excited by the easy access we found. The next day we returned to Lawrence Glacier. We quickly made our way onto the ice. Soon we had our crampons on and were covering new territory. We reached the first steep section and Brian climbed it without protection, then built an ice anchor to belay me. I climbed after him, and now we were high on the glacier. Its curves glittered in the sun and blue crevasses regularly sliced into its depths. The surface rippled with what mountaineers call “sun cups”. We climbed around on the labyrinth of ice and eventually reached an obstacle Brian wanted to cross and I didn’t. It involved a step over a crevasse with a deep hole (moulin) next to it. I didn’t like the deep hole, which would be difficult or impossible to escape from. I practiced building ice anchors while Brian stepped across the crevasse and explored higher. He soon returned and we decided to descend. I rappelled off my own ice anchor and then Brian climbed down after me. Brian was confident on steep slopes in his crampons. 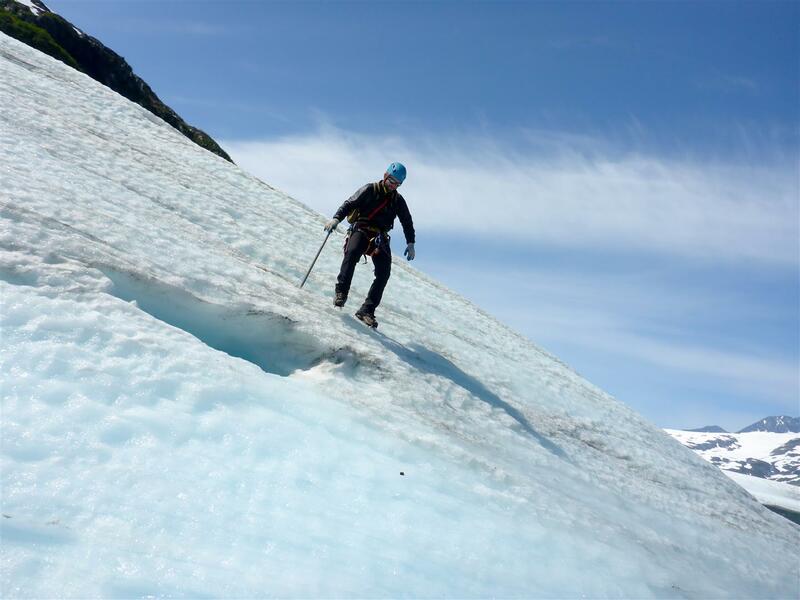 I really appreciated that he could lead our climbs on the glacier, since Lawrence Glacier was even steeper than the glacier where we took our class. I felt comfortable following him and enjoyed building my own anchor and rappelling off it. We even found an ice cave! 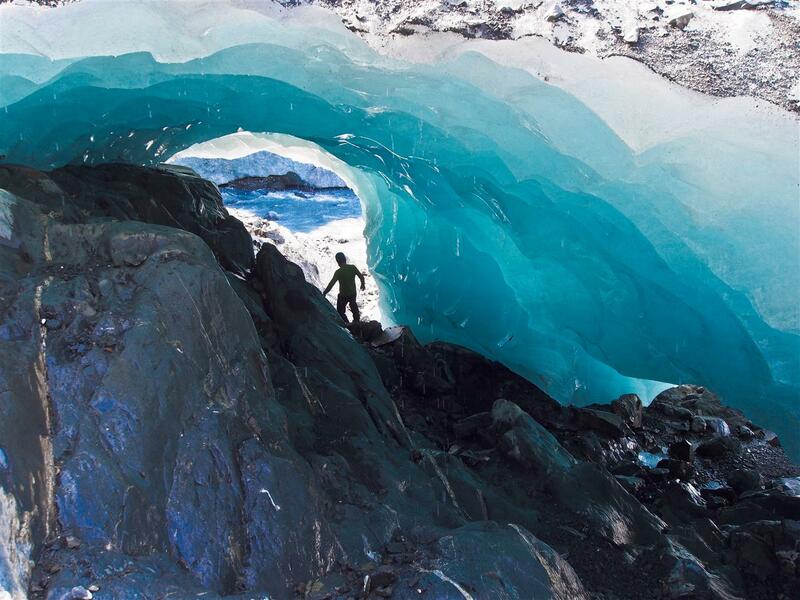 Exploring the glacier was one of the coolest things I’ve ever done. We both had a fantastic time. The next morning was our last in Blackstone Bay. We wanted to make the most of it and left early to get in one more paddle. The water was flat and gray, dotted with small white iceburgs. We got in our kayaks and paddled toward one of the glaciers. Soon I began spotting seals in the distance floating on pieces of ice. We fell silent and slowly glided over to them, being sure to give them plenty of space. Imagine my excitement, and the conflicting need to stay quiet and still so as not to startle them. I was *bursting*! They were incredibly cute and blubbery. We took many, many photos. 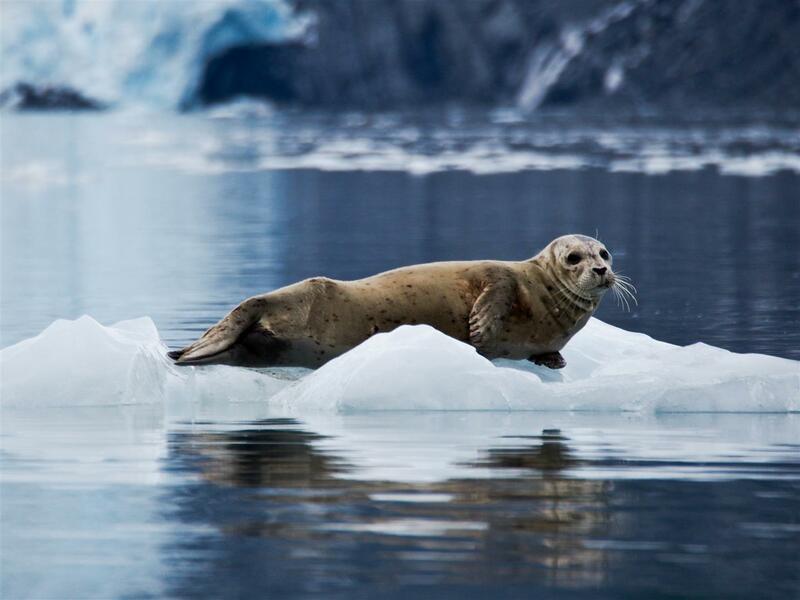 When we were back at camp later the seals floated by on their pieces of ice out in the middle of the bay, riding the tide, looking relaxed. At the termination of this dreamy trip we knew, looking at our giant map of Prince William Sound, littered with islands, bays and glaciers, that we would be back. Next time we’ll be prepared to see more of this glacier-filled paradise. Maybe we need a small boat for Alaska. We need another tiny floating house. 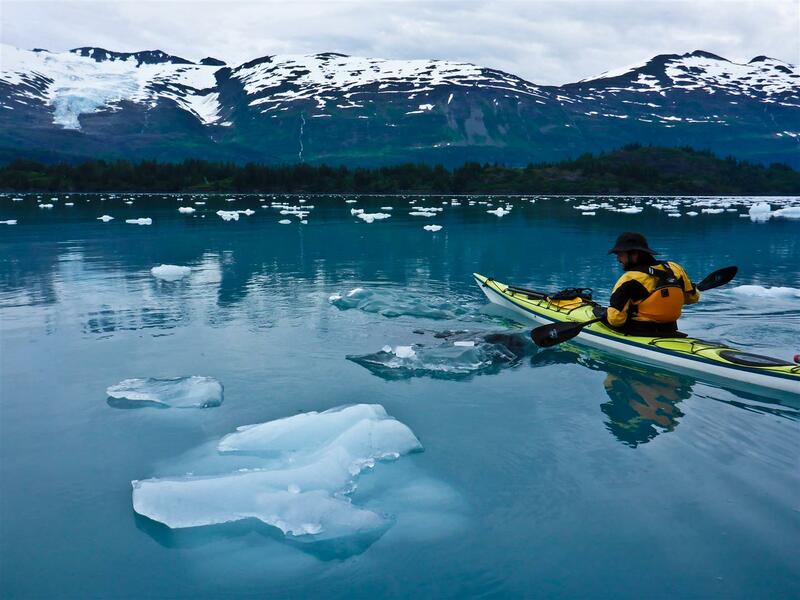 Most people don’t go too far above sea level during a kayaking trip in Glacier Bay. 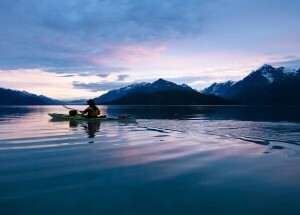 With at least 100 miles of great paddling to choose from, that’s usually the focus. We spent 13 days kayaking in Glacier Bay, so we took time to do a few day hikes as well. The most memorable was a hike near Scidmore Glacier on the third day of our trip. Brian looked at a topo map and realized the high point next to us would have a view for miles around, only it was covered in horrible, Alaska brush. 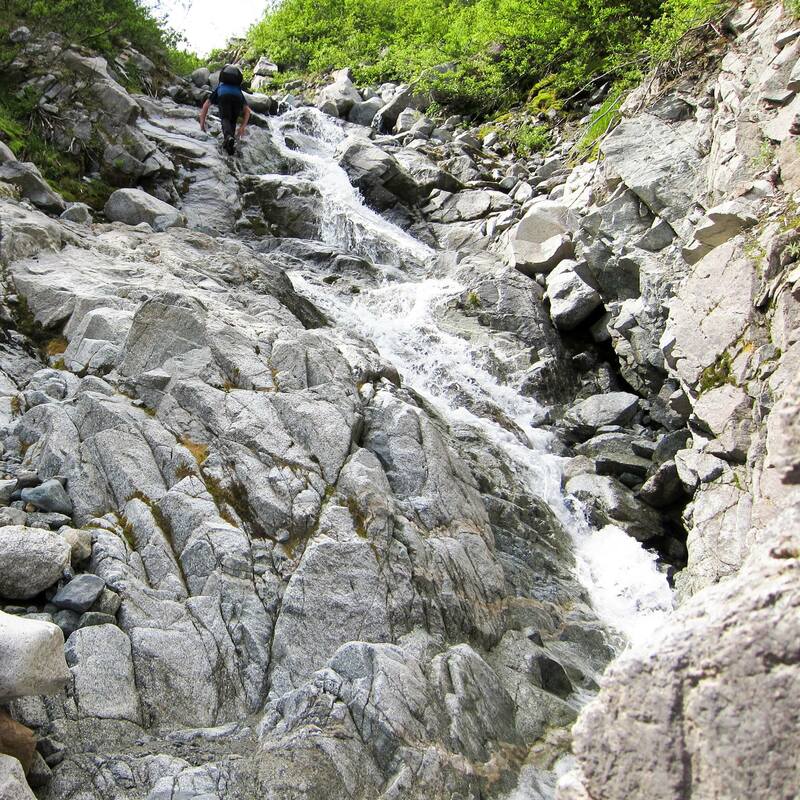 If you’ve ever hiked in Alaska brush, then you know this is to be avoided at all costs. We could see a small, gray canyon winding its way up the mountain. We could try to climb this canyon all the way to the top of the highest ridge, about 1800 feet. We had no idea if it would work, but the route just beckoned to us. We navigated to the bottom of the canyon, crossing several glacial streams on the way. Then the fun began! The gully was gushing with crystal clear water, flowing down a tumbled bed of granite boulders with the occasional small waterfall. There was no brush and the route was fun, cool and splashy. 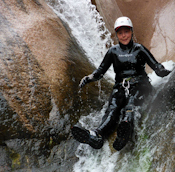 It felt like canyoneering as we worked our way up the granite boulders in this flowing mini-gorge. We enjoyed a really fun ascent up to the ridge. Near the top of the ridge, we exited the canyon and hiked up a small summit. At the top we took in amazing views of the East Arm of Glacier Bay with several glaciers curving down to the sea, and Scidmore Bay dotted with small islands. 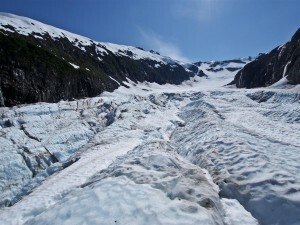 Some other good hikes on rough paths took us near Reid and Lamplugh Glaciers. The jagged, blue ice of these huge glaciers was fun to view from different angles. 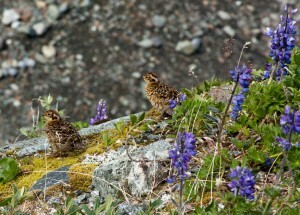 We also saw plenty of Ptarmigan while out hiking, including Ptarmigan chicks. We picked wild strawberries at several camps. 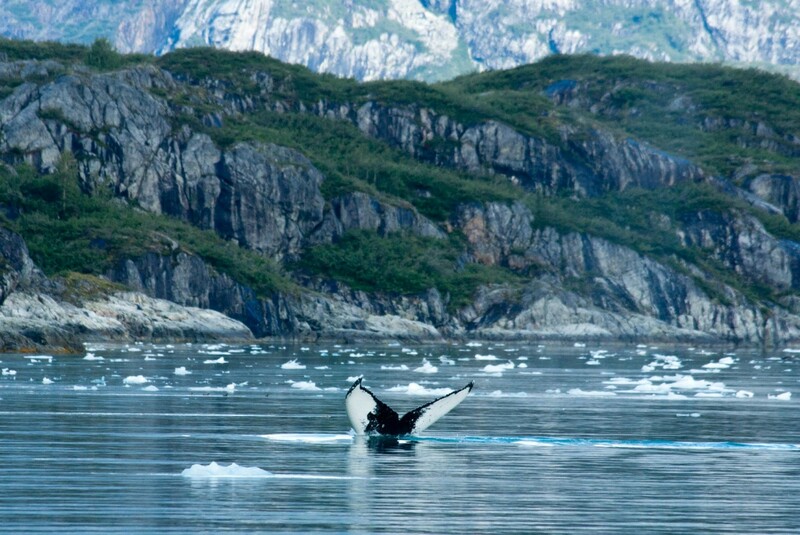 Our time on land in Glacier Bay was really memorable. It was day three of our trip. We were paddling in Beartrack Cove in the Beardslee Islands. It was 5 AM. Light crept from behind white peaks toward dark blue clouds in the sky. The ocean was calm and blue-gray in color with patches of round kelp bulbs floating on its glassy surface. Suddenly we heard the unmistakable hissing of whale breaths nearby. These loud breaths can be heard from a long distance away, but these whales sounded very close. 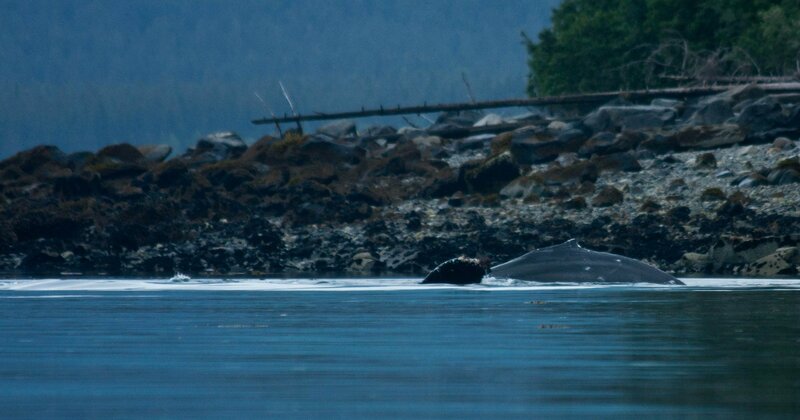 We rounded a corner and found two Humpback Whales feeding in a kelp bed. They wallowed in the kelp, their huge fins flopping above the water surface. Their breaths sounded more like deep roars than gentle hisses at this closer range. These 40 ton whales seemed completely focused on feeding. We slowly backed up as they rolled around and fed for a few minutes before moving on. We felt pretty small floating around in our boats compared to the size of the whales. After all, 40 tons is equivalent to the weight of about 500 people. These whales were huge. That was our closest encounter, and we continued to see Humpback Whales almost every day during the rest of our trip. We would joke about reaching our whale quota for the day because they seemed to reliably appear on a daily basis. 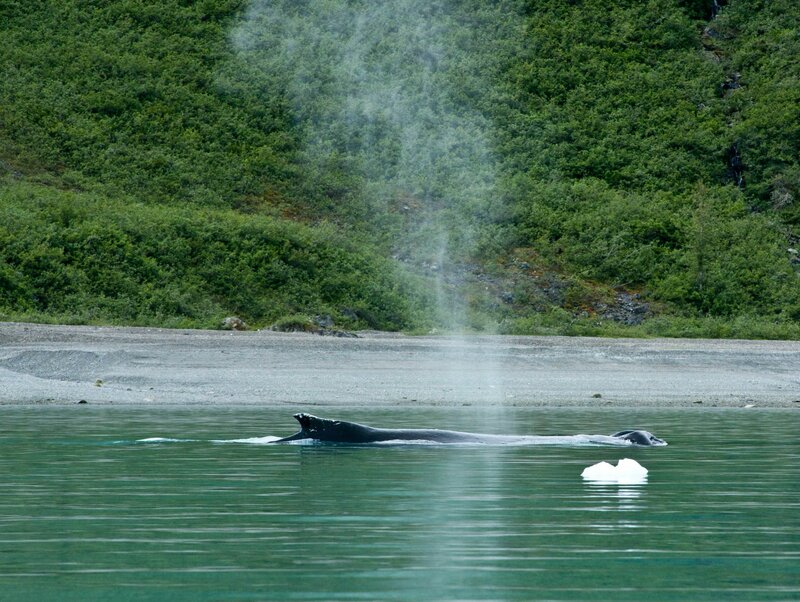 Often we would just be enjoying a quiet campsite on a beach when suddenly a whale would randomly surface nearby, hissing loudly, dorsal fin arching gracefully above the water surface. Sometimes we would be paddling our boats when we would hear the whales nearby and see them swimming at the surface, usually travelling about the same speed as our kayaks. It was always exciting to see their huge fins and tails break the surface of the water. Humpback whales have even been known to acrobatically leap into the air, which is referred to as breaching. 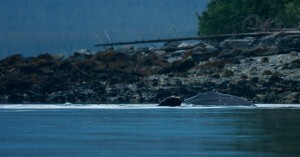 We really wanted to see a whale breach, as long as it didn’t happen too close to our kayaks. We didn’t end up seeing a breach this trip, which is just another reason to return to Glacier Bay in the future to visit the whales again. It was exciting and a bit intimidating to be in our small sea kayaks with these giant whales in the water nearby. Viewing them from the surface of the water really accentuated their size and power. 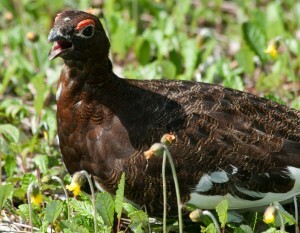 My first meeting with a ptarmigan occurred during a hike in brush near Scidmore Glacier. 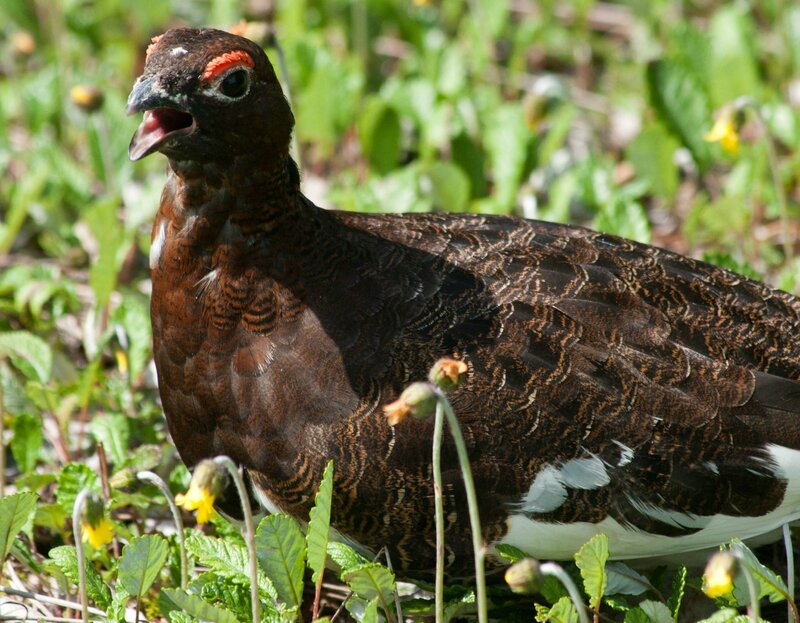 Suddenly we were charged by a growling Alaskan animal, the Rock Ptarmigan. 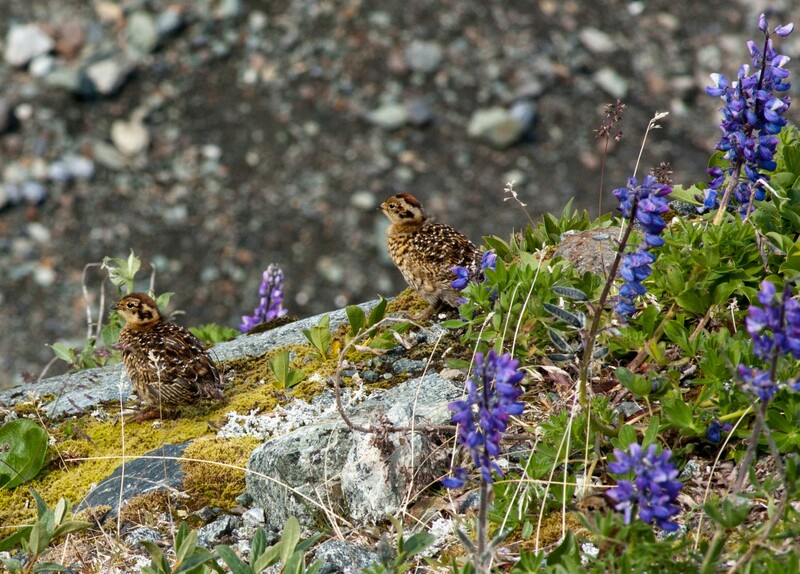 Apparently we had come too close to two tiny ptarmigan chicks hiding in the grass. The parents tried their best to distract us from the chicks. They made a low, growling sound as they circled us for several minutes. The birds in Glacier Bay definitely let you know when you’re not welcome! Then there was the Oystercatcher I approached on a steep beach. Instead of turning around and running the other way, it quickly advanced toward my ankles, emitting its signature “peep-peep” sound. I backed off, and it quickly plunked itself down on its nest about 20 feet away. 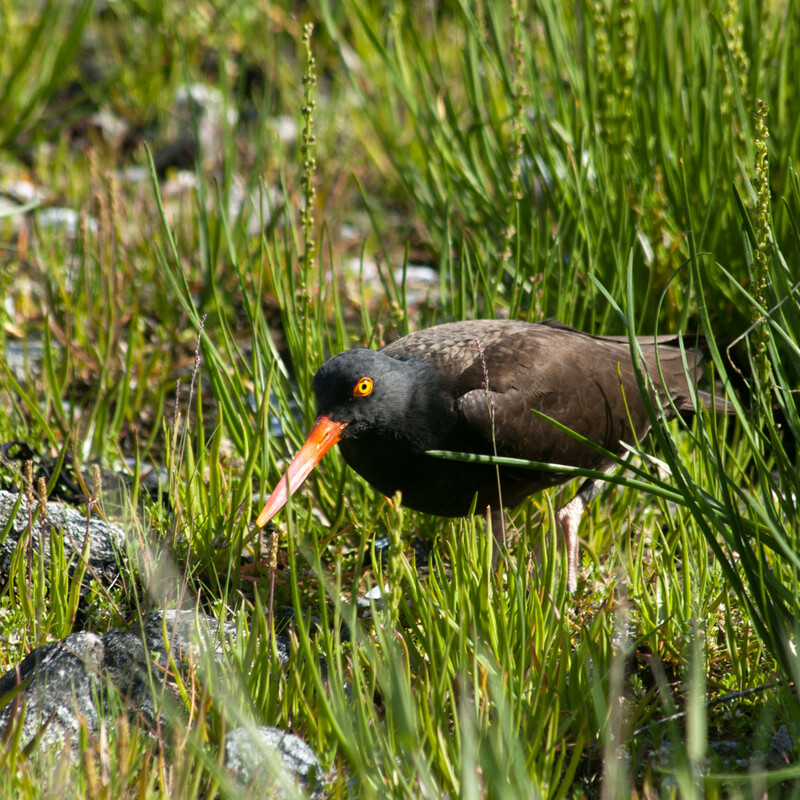 During 13 days of kayaking we didn’t just watch the birds here, we interacted with them. They constantly approached us, amused us and become a great memory from our trip. These bold, badass birds did not fear humans. They merely saw us as part of the environment with which they interacted daily, and when they didn’t like what we were doing they let us know. A funny encounter took place when Brian was cruising along in his kayak and watching some Kittiwake chicks waddling along the beach. He was taking photos with a telephoto lens and was pretty far from the chicks but the Kittiwake parents were not pleased. One of them began dive bombing Brian in his kayak and attempting to poop on him. I got to watch all this from about 50 feet away. I’m so glad they all missed him! Brian got his photo and quickly moved along as the Kittiwake parents continued to scold us from the beach. 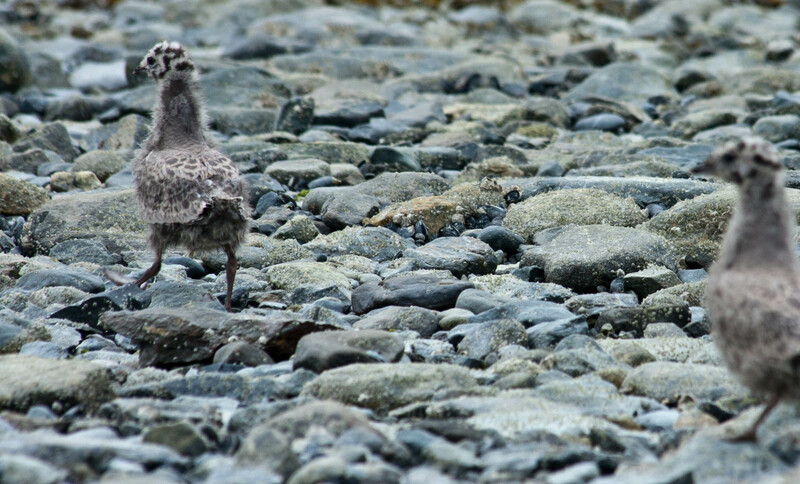 We nicknamed one rocky beach “Angry Bird Beach” near Johns Hopkins Inlet because when we landed to quickly boil water and warm up, the Kittiwakes began dive bombing us immediately. We huddled under a tarp in the pouring rain as they cried out to us, the invaders of their exclusive spot. I’ll bet they were happy when we finally left! We saw many Bald Eagles and Golden Eagles. Our most memorable encounter was kayaking under two eagles flying about 40 feet above us fighting over a fish. 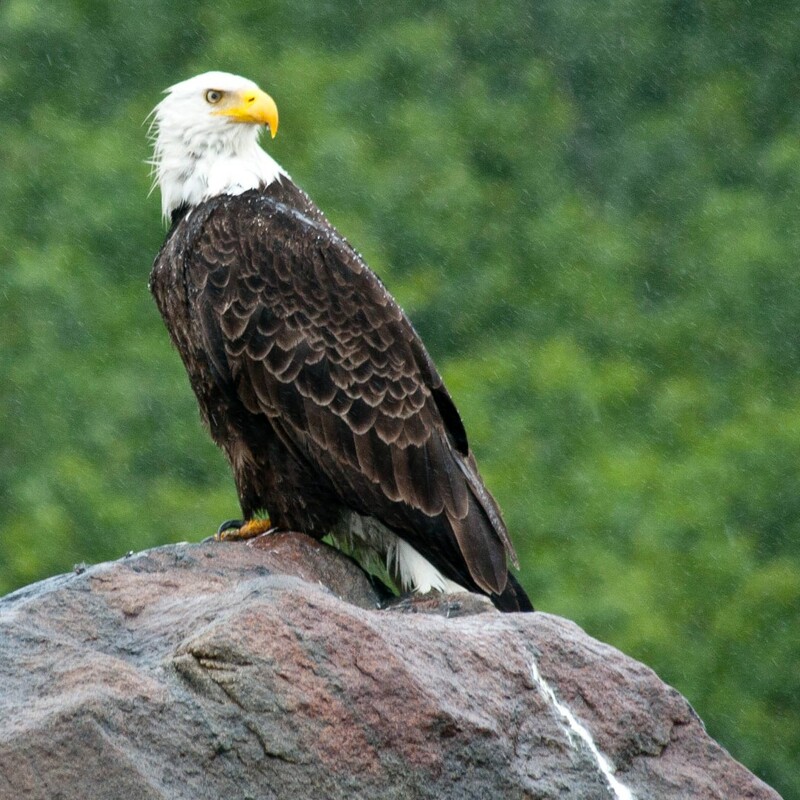 We typically spotted a couple eagles each day. They tended to be shy and elusive. 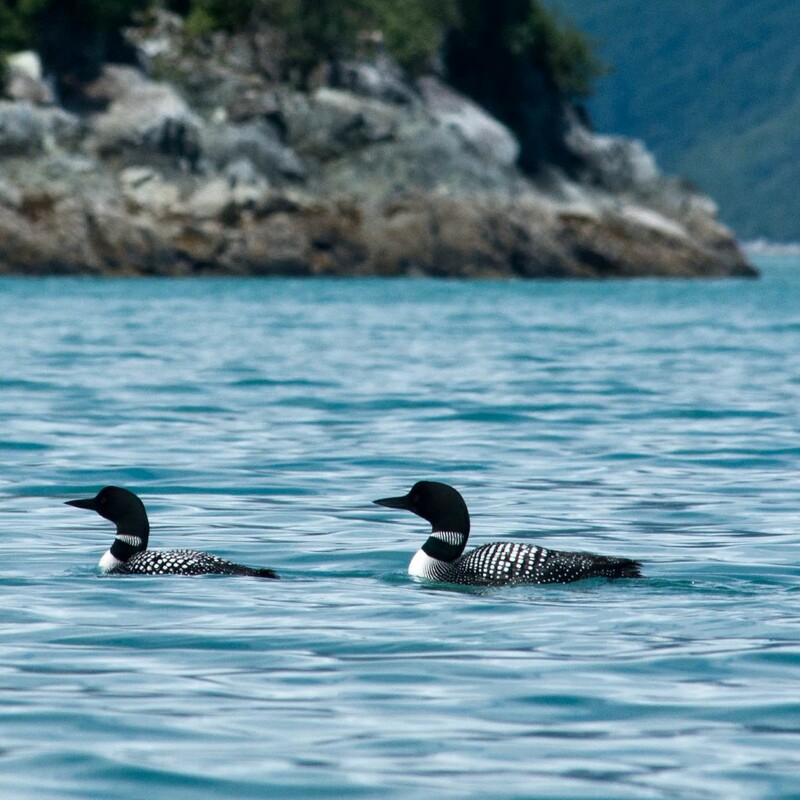 We really enjoyed the Loons, with their high pitched calls and interesting habit of ducking under the water to hunt or hide from approaching kayaks. Actually, many different species of birds surfaced quickly for a look at our kayaks, then quickly dove back under the water to safety. Once while kayaking in turbid, silty water near a glacier, one of these diving birds bumped into the side of my kayak! I would guess that the water was too turbid for the bird to know my kayak was there. The birds we met in Glacier Bay were definitely amusing and memorable. 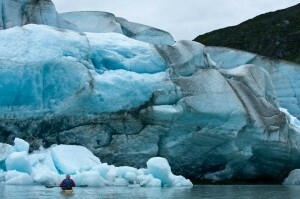 We just returned from a great 13 day sea kayaking trip in Glacier Bay National park. Even after dozens of humpback whale sightings, we never got tired of seeing the gray-blue curves of these 40 ton whales surfacing near our kayaks and campsites. The numerous sea birds and ptarmigans provided endless amusement as they scurried about busily, finding food and charging us when we wandered too near to their nests and chicks. The hundreds of shy seals and sea otters were always exciting to see as their cute and curious faces surfaced for a quick look. The glaciers and floating sea ice glowed with otherworldly shades of blue and changed each day as the sea ice melted or more new ice calved from nearby glaciers. The trip was full of magic and it’s hard to imagine finding another backcountry experience that could match Glacier Bay. This trip featured more animals than any other place I had been, more cold and exhaustion than I had ever experienced, and already I want to go back and do it all again. It had been about five years since my last long sea kayak trip. That one didn’t go well and left me with some lingering anxiety about this activity. 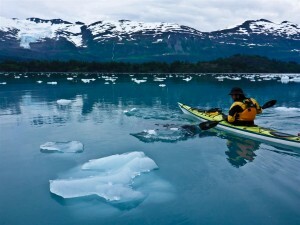 When Brian wanted to return to Glacier Bay, saying his last trip there had been the best trip of his life, I hesitated. He tried to tell me about the humpback whales, the glaciers, and the constant parade of animals competing for his attention during his previous trip. “We could just go hiking instead”, I countered. 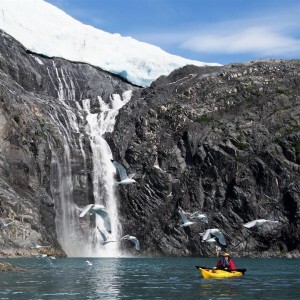 The best parts of this national park can only be reached by boat and to have this great experience I would need to overcome my aversion to long sea kayak trips. Sure, I go on short paddle trips all the time and love the water, but my last long expedition at sea ended badly and I haven’t been on another trip like it since. It was five years ago in the San Juan Islands off the coast of Washington. On the third day of our trip, we paddled a mile across open water in 2 foot waves which already felt a little big. As we neared the tip of Speiden Island in front of us the ocean changed suddenly from gentle laps to violent roars and 4 foot breaking waves. We were caught in a powerful tide rip and I didn’t know how to self rescue if the boats tipped over. My partner expected easy conditions and had decided not to wear a wetsuit that day. The islands nearby were private property so we couldn’t pull over. We continued all the way to Stuart Island through more waves. I couldn’t wait to get out of the boat. Once on Stuart Island we were stuck for the next two days as a storm rocked the San Juan Islands and kept the sea in a lumpy, angry state. I didn’t want to repeat that experience so I had a lot of questions about our sea kayaking trip in Glacier Bay. We planned the trip carefully, studied the nautical charts and took a route far away from any challenging areas with tide rip potential. We shopped for the most stable sea kayak we could find, and also bought a nice drysuit to ensure comfort and safety in the cold, 32-40 degree water of Glacier Bay. 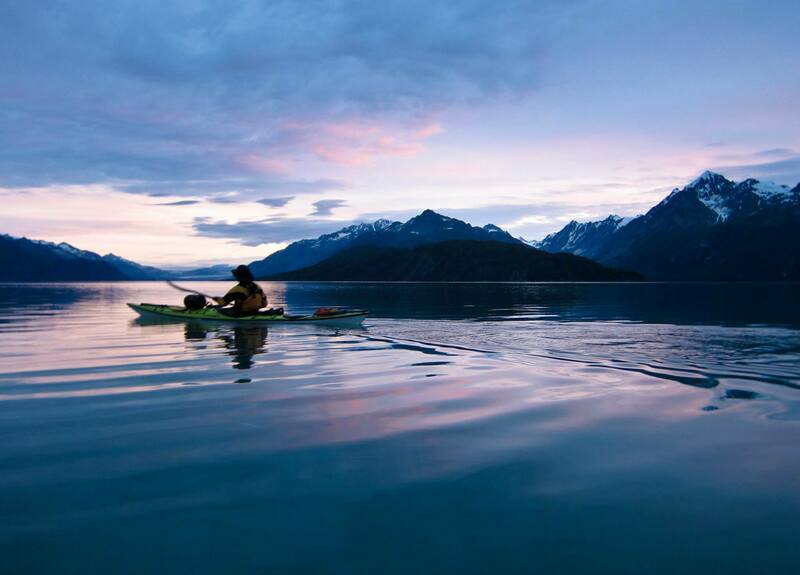 Glacier Bay was a good place for easy paddling conditions, especially in the early morning hours. The days were long and the Alaskan midnight sun illuminated the sky nearly all night long. 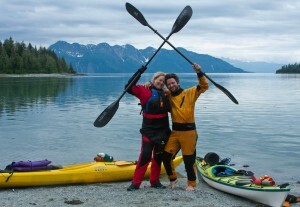 One day we began paddling at 2 AM because the sea was calm and tides were in our favor. The water in the bay is pretty protected and we didn’t encounter any dangerous waves or tide rips. Most of our paddling took place on flat, calm seas. I’ll write more about Glacier Bay soon. There are so many moments to share about this amazing trip.